Mohamed Nasheed. Some rights reserved.The former President of the Maldives and global climate activist Mohamed ‘Anni’ Nasheed was arrested on February 22 on “terror” charges just days before he was to lead a mass demonstration against the current government. Both the UN and the EU have issued statements of concern over what now appears to be an escalation by entrenched power holders in the Maldives to stifle effective political opposition. Known to outsiders for its pristine beaches, clear turquoise waters, and five-star luxury resorts, the Maldives is a nation of about 340,000 people spread across an archipelago of 26 atolls located in the middle of the Indian Ocean, roughly 500 miles southwest of Sri Lanka. Its natural beauty is its biggest asset, given that nearly one-third of the country’s GDP is generated via tourism. But that beauty also has a way of obscuring the intense political struggles that have come to characterize everyday life for most Maldivians over the past 30 years. 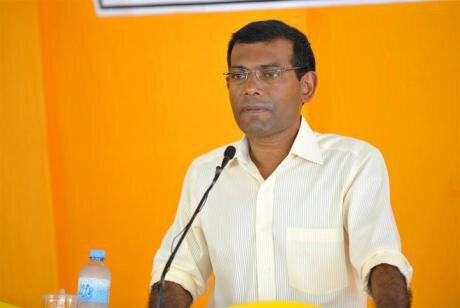 In 2008 after almost a decade of nonviolent struggle for free and fair elections, Nasheed succeeded in becoming the nation’s first democratically elected president after defeating at the polls South Asia’s longest-standing dictator, Mamoon Abdul Gayoom. He served as president for three years, attempting to rebuild the nation’s crumbling institutions and infrastructure, and campaigning internationally for action against climate change by showcasing the effects of rising seas on the low-lying and densely populated island nation. 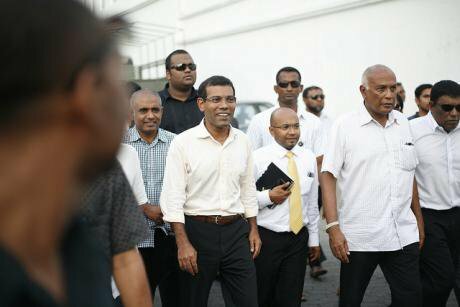 In February of 2012, Nasheed was forced out of office in a swift and bloodless coup, staged by security forces working in concert with elements of the former regime and a notoriously corrupt, hostile and inept judiciary. He again campaigned for re-election in 2013, only to be stopped this time by judicial proceedings that cancelled one election in which Nasheed was placed first, and stalled another polling date for long enough for the current president, Abdulla Yameen Abdul Gayoom, the brother of the former dictator, to obtain a win. Nasheed and other Maldivian democrats responded by working within the system, through organizing popular pressure on behalf of reform, and drawing international attention to democratic backsliding, shrinking press freedom, and rising corruption. With decades of experience waging these struggles, credibility with diplomats in the region and international institutions, and increasing popular support, Nasheed’s efforts began to gain traction--until he was arrested on February 22. So what were these “terrorism” charges? The context of events began after the 2008 elections when, as president, Nasheed sought to bring cases against figures in the corrupt resort-owning elite that had amassed fortunes thanks to the cronyism that characterized the Gayoom years. Nasheed had been campaigning on a commitment to focus on needs in transportation, education, and public health, as well as infrastructure to combat rising seas--all of which were neglected and crumbling during 30 years of authoritarian rule. Just one problem: the nation’s judiciary remained largely in the hands of figures from those earlier decades. The country’s Chief Judge of Criminal Court Maldives quashed countless corruption cases involving members of the former regime until finally a constitutionally appointed committee charged with judicial oversight and reform tried to indict him. Judge Mohamed failed to show up at his initial hearing, and then later moved to quash his own charges and arrest warrant, prompting President Nasheed to arrest him. Nasheed’s decision to arrest Judge Mohamed was portrayed by his political opponents as a gross violation of his power and that was used to justify the putsch in February 2012. Pres. Mohamed Nasheed summoned to police HQ in 2012. MinivanNews/Flickr. Some rights reserved..This same episode is now being re-invoked by the judiciary to justify Nasheed’s current arrest, somehow labeling his action three years ago as “terrorism”, despite the fact that force had been used against him to compel him to resign. Moreover, Nasheed has been refused access to his attorneys because they were unable to register themselves with the court, since a trial was called within 24 hours. To get him to the court, the authorities dragged him on the ground into the chamber, injuring him. All this is deeply ironic in light of Nasheed’s long personal history as someone dedicated to nonviolent struggle during his years of democratic activism. That dedication was honored by his receiving in 2012 the James Lawson Award for Outstanding Achievement in the Practice of Nonviolent Action. The Lawson Award is named after the famous nonviolent strategist and advisor to Dr. Martin Luther King, Jr., the leader of the American civil rights movement. Nasheed is probably the Maldivian political figure who is least likely to have committed or condoned “terrorism”. It is now clear that if these charges go through, Nasheed could face three years in prison, just long enough to prevent him from running in the 2018 presidential elections. Even the possibility of pending terrorism charges might give the government leverage against a bid made by Nasheed to participate in any official political action at any point in the future. In previous episodes when force or extra-legal action by Maldivian authorities were used to suppress Nasheed’s political activity, international actors were initially slow to take the initiative of bringing their influence to bear – although they must have recognized that the Maldives have been through a long and difficult process in achieving democracy. In 2008, success in bringing about the nation’s first free and fair elections was in no small part due to the pirate radio stations created by Maldivian democrats which ensured that the movement could reach both foreign and domestic audiences with its own voice. Through these ‘minivan’ broadcasts (‘minivan’ means freedom in Dhivehi), they were able to provide evidence of repression, corruption, and human rights violations to organizations like Amnesty International. Once these reports were confirmed, the way was open for other state and non-state actors to put pressure on the old regime. In the run up to the 2008 elections, the movement’s effectiveness in alerting the international community to support free and fair elections meant that the world was closely watching, ensuring that the state could no longer tamper with the electoral process and that all the opposition parties, not just Nasheed’s Maldivian Democratic Party, could participate on a level playing field. However during the 2012 coup it was the former regime that seized the initiative in laying down the narrative of events and shaping international perceptions, which helped ensure the success of the putsch. They forced Nasheed to ‘admit’ overreaches in his power as president and affirm the constitutional validity of the change in leadership. Meanwhile members of the former regime had their own supporters take to the densely populated streets of the capital, effectively creating the perception that Nasheed resigned amidst popular pressure. Of all the methods used by the political forces that support the former dictator and his family--in the effort to manipulate democracy, maintain a solid hold on the hundreds of millions of dollars in tourism revenue generated annually, and deal profitably with new business partners such as the Chinese government--their control over the nation’s judiciary is perhaps the most reliable. When repression is wrapped in a judicial garment, it is easier to keep international actors at arm’s length. It not only applies a superficial veneer of legitimacy to political irregularities, it forces anyone who is suspicious enough to want the full story to try to disentangle a complicated web of history and judicial action before getting to the truth. This is one way that countries are kept in the cage of corruption. The present leadership of the Maldives doubtless hopes that influential international actors – who could otherwise deploy sanctions on behalf of rights and democratic standards – will continue to find the Maldives too small, too unserious, and too corrupt to justify such time and effort. But until they do, a kangaroo court may remain in control. According to the Maldivian ministry of tourism, Nasheed’s actions along with the popular outrage that followed in the wake of the 2012 coup scared away an estimated 40,000 tourists for the remainder of that year. Such actions also forced the coup-government to spend the equivalent of 4.5 million US dollars on an international public relations campaign designed to offset the losses generated by negative headlines. In the present crisis, the UK government has already issued warnings stating political unrest brought about by Nasheed’s arrest might make for an unpleasant holiday. The bottom line is that ‘unrest’ is costly, however much the tourism industry has sought to protect itself by hiring legions of illegal foreign workers, mostly from Bangladesh, to supplant local employees. According to the Minister of Economic Development, as of mid-February 2015 there are 116,000 foreign workers in all sectors of the Maldivian economy totaling now roughly half the work force. Meanwhile youth unemployment for Maldivians has continued to hover around 43 percent. Reacting to this new arrest of Mohamed Nasheed, the early statements made by the UN, EU, and Indian Ambassador to the Maldives, all calling for transparency and the rule of law to operate in his trial, might be taken as a sign that the campaign to draw attention to the country’s unaccountable judiciary has had traction internationally. Yet the current situation in the Maldives still presents international actors such as the United States, the British Commonwealth, and the European Union with an urgent opportunity to call for enforcing democratic norms, without military intervention or involvement in regional disputes. Because this is a struggle being waged by Maldivians using local nonviolent resistance, international actors can support it simply by emphasizing the need to enforce the rights of citizens and protesters in the Maldives. Doing this will help boost confidence by ordinary people to make their voices heard against injustice while reducing the government’s room to avoid accountability. The attempt to blunt the successful and largely nonviolent Maidan revolution in Ukraine through armed rebellion and military intervention generated global news coverage, serious international sanctions, and international summit meetings. But can the international community only notice annexations, rebellions and other military crises? Or will it bother to take action when the people in a far less conspicuous nation, where general violence has not yet occurred, face a crisis equally alarming for them: the arrest under bizarre circumstances of their country’s first democratically elected president, by a rogue branch of a government that may be backsliding into its authoritarian past?